The Lark Bunting is a common bird on the Great Plains. Flocks of Lark Buntings return from their Southern Migration in April and inhabit the grasslands, sage and other open habitats up to 8,000 feet in elevation. They fly South again in September. The males are black with snowy white wing patches and edgings, tail coverts and outer tail feathers. In winter the males change to a gray brown like the females, except the chin remains black and the black belly feathers retain white edgings. The female bird is gray brown above and white below with dusky streaks. 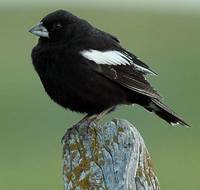 The Lark Bunting was adopted as the official Colorado State Bird on April 29, 1931. Diet: Insects, especially grasshoppers; grass, and forb seeds. During breeding season, 80% insects. Voice: Song of repeated low, liquid, whistled notes pwid pwid pwid pwid too too too too kree kree kree kree pwido pwido...; interpersed and overlaid with high, silvery rattles tt tt tt tt; entire song rich, complex, and repetitious, with relatively slow tempo. Call a low, soft, whistled heew or howik. Habitat: Nests in dry plains and prairies, especially in sagebrush. Displays: Conspicuous male flight song and display begin by rapid ascent to 20'-30'; male pauses at top of ascent, then with jerky movements of extended wings, floats butterfly-like to ground opposite starting point. Nest: Usually rim of cup flush with ground level, occasionally slightly elevated, often sheltered by overhead vegetation; woven of grass, forbs, fine roots, lined with finer grass, stems, hair, plant down. Eggs: Averages 4-5 pale blue, greenish blue eggs, occasionally spotted with reddish-brown. 0.9" (22 mm). Here's a great book, Guide to Colorado Birds , that gives wonderful information and photos of all of the birds of Colorado, including the Lark Bunting.